Hawthorn trees are in bloom, with a white and green loveliness that seems bridal. I think Anne of Green Gables would loved them. On docks throughout our region, conservationists have been encouraging purple martins to rebuild their population by providing houses for them. The program seems to be successful. When we were out on Sidney Island, pairs of martins chattered, swooped in and out, and seemed very at home on their perches. In my garden the foxglove is blooming. She stands taller in the morning freshness than in late afternoon. We've had some very warm weather, but I'm not going to complain at all. Thyme is blooming, and how the bees flock round. There's a steady buzzing as they fly from the rosemary to the chives to the thyme and back again. One more hawthorn photo. So dreamy. They are so delicate and soft looking now, and equally striking in the fall with their rich red berries. A tree for all seasons! We planted a pink Hawthorn in our French garden. I hope it is still there. It is such a beautiful flower. Loveliness! It is good that the martins are returning. They are such helpful birds . . . and fun to watch! I can almost hear the bees buzzing around your pretty flowers. You have captured it all so well. Wonderful that the purple martin project is a success. Glad to hear that the purple martin project has been a success. A joy to see the beautiful blossom. Seems like the weather is too cool or too warm. We also have hot weather suddenly. You photos are great, but the last one especially evokes emotion with its simple beauty. I love watching those purple martins darting in and out of the nesting boxes and their distinctive call is music to my ears! I remember going to Newcastle Island Provincial park on our boat where there was a camera inside one of the nesting boxes...our children were younger and they found it fascinating to watch. I've always loved the hawthorn blossom - brings back childhood memories of the fields around our home in Devon, hedgerows looked snow-covered when hawthorn bloomed. Things seem to be opening and coloring your landscape now Lorrie - know you are anxious for warmer weather and getting out in that delightful boat I'm sure! Lorrie, Thanks for sharing the blossoms. I love the bird photos as well. I have scoured my neighbourhood to identify where the bird feeders are so I can hopefully catch a few pics of them feeding. Have a great week. Sylvia D.
Very dreamy for sure. Beautiful photos Lorrie! So very pretty! Birds and blooms ... two of my favorite things. Lots of beauty! Thank you for sharing these photos with us! We've never had hawthorne shrubs, don't even remember seeing them but these are beautiful. Are hawthornes what make up lots of the tall shrubs that border country lanes in England? For some reason I think I remember reading that. 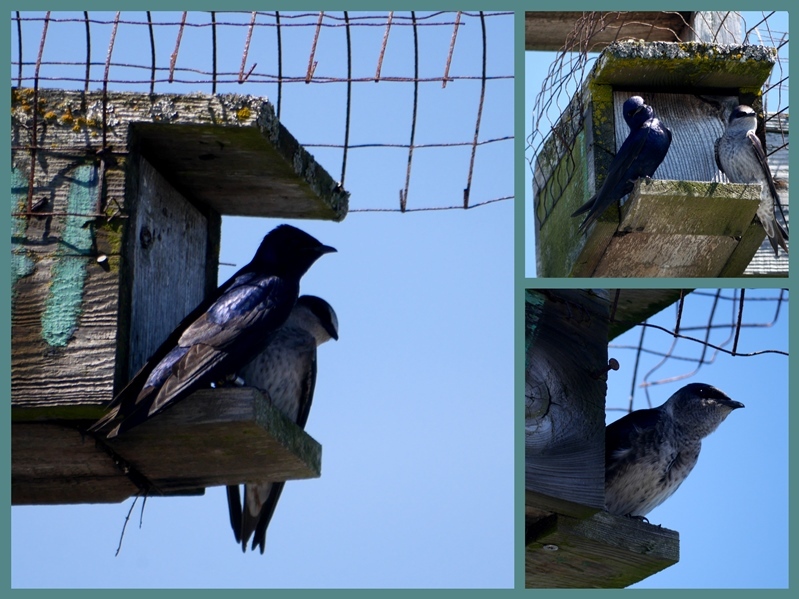 We were so thrilled to see a flock of purple martins moving into the neighbor's martin houses a few weeks ago. It looks toward the pond and it is fascinating watching them soaring and diving in the sky over it. Hope that means less mosquitoes for us. Summer seems just around the corner, doesn't it? Beautiful blooms...and birds! I am not familiar with the hawthorne bush...must check it out. Anne Shirley would definitely approve of the pretty Hawthorn blooms! Foxgloves are on of my favourite flowers, I grew lots in England but just don't have success with them here in Ontario. Your hawthorn blooms really are dreamy looking Lorrie and as Linda said above, foxgloves don't seem to survive in my garden either. There used to be a lot of purple martin houses around here since we're near an inland lake but I haven't seen any for a long time - a different generation and the new one hasn't picked up on the idea yet. All your blooms are sooo pretty...and what great photos you take. Stunning photographs of gorgeous flowers, you can certainly make that camera work wonders! The hawthorns here have flowered, gone for another year and been replaced by pretty elder flowers and Queen Anne's lace. Frothy white blossom perfect for a June bride. Truly a gorgeous "White way of delight!" The birds are just beautiful. I have never seen a Martin before. Have a wonderful week filled with sunshine. Photos are exquisite. Love, love your purple martin close ups. Beautiful images of your garden in bloom, Lorrie. The hawthorns are heavenly, and you have captured them so magically, too. How pretty is that pinky-purple thyme! It's so inspiring to see a project like the ones for the Martins be successful in assisting their population growth! oh the start of spring must surely be the most delightful time of year. Enjoy! Just lovely to look at, thank you. Dreamy...reminiscent of the cool lane that goes behind the house, past the shed, and down behind the barn...yes, I know such a cool green place where the hawthorn grows.